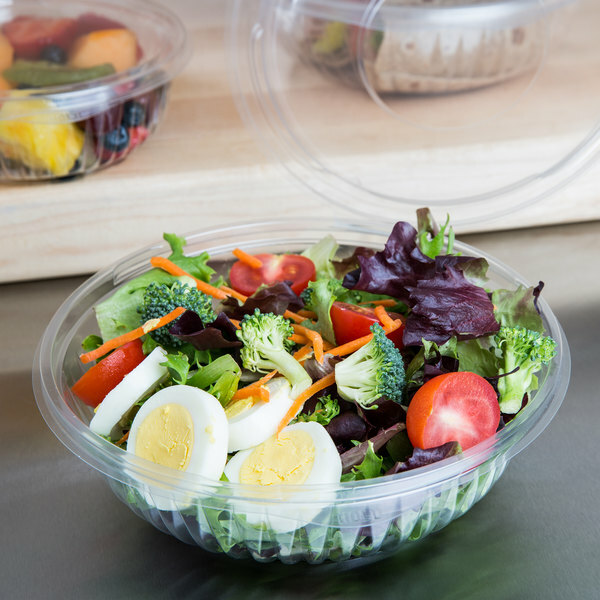 PresentaBowls, our line of clear, crystal-cut bowls, create a striking product presentation when used to package or display virtually any food item. Their crystal clarity allows for easy product identification and merchandise appeal while the elegant design creates an upscale presentation. 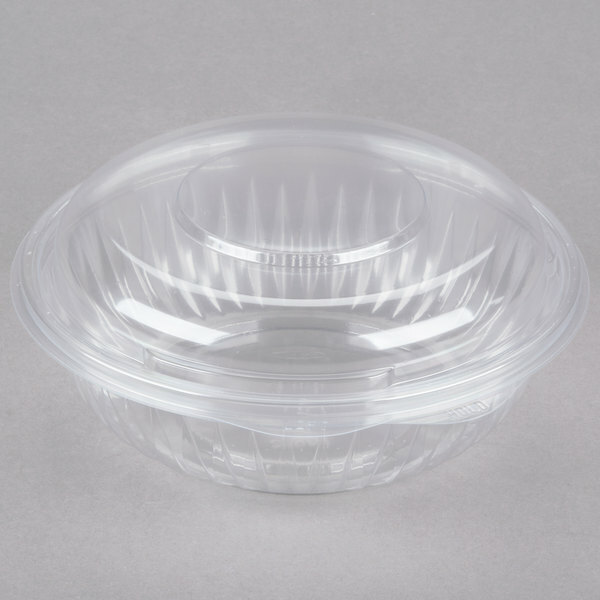 PresentaBowls have a 360 degree perimeter seal, which not only maximizes product freshness, but also prevents packaged foods from spilling or leaking. Opening and closing PresentaBowls is a snap! To close, simply place the lid on the container and chase the seal until and audible snap is heard. The opening tabs facilitate easy container opening. Separation lips on our bowls and lids allow for easy, one-hand separation from a stack. In addition, the stacking alignment ring and stacking recess allow the bowls to fit securely with one on top of another for greater stacking stability. The juice well on the base of our bowls captures liquid, preventing product saturation and helping to extend product shelf life. 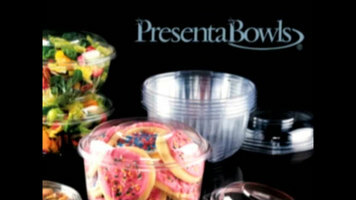 PresentaBowls are available hinged or as a 2-piece product with both flat and dome lid options available. There's a choice of 7 popular sizes that ranges from 8 oz. to 64 oz. With so many options available, you're sure to find the perfect one to fit your application needs. For more information, contact your Dart sales representative or speak to one of our customer service staff members today! Use Dart Solo's clear, crystal-cut PresentaBowls to package and display your foods! 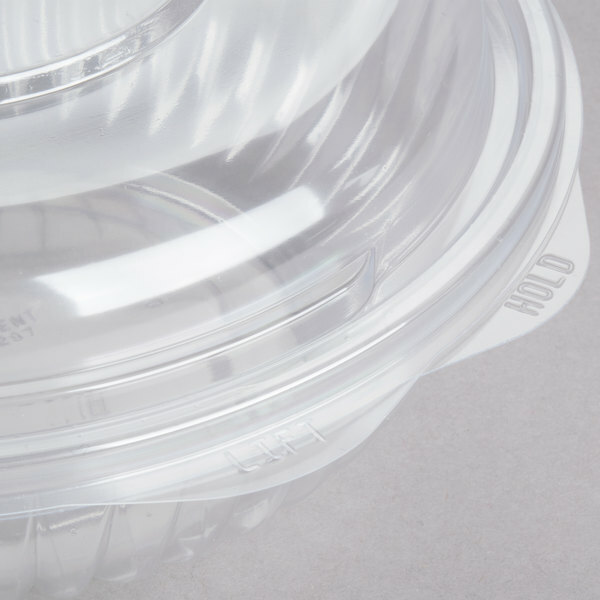 With snapping seals and juice wells, these bowls will extend product life and give you an upscale, efficient way to sell your freshly-made foods! Can I put my Dart PresentaBowls in the microwave? Dart PresentaBowls can withstand limited microwaving. They will not withstand microwaving to the point of boiling. We recommend stirring the contents occasionally. Reduce lidding confusion and consolidate your product inventory with this Dart C24HBD PresentaBowls 24 oz. 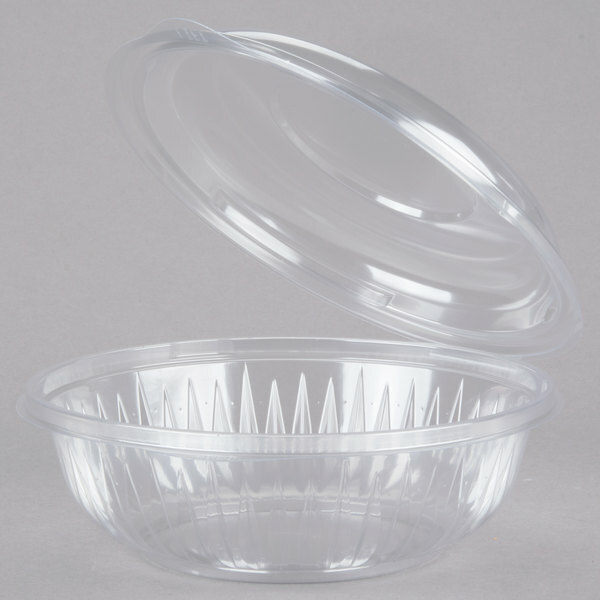 clear hinged OPS platic bowl with dome lid. 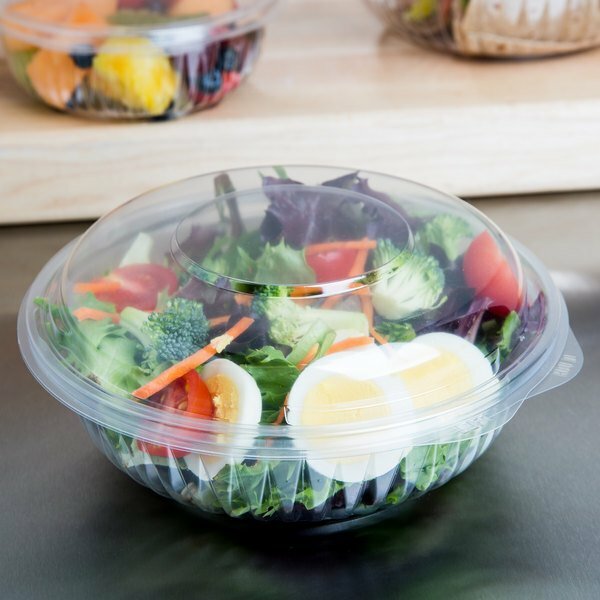 The convenient domed-lid design ensures enough height for high-stacked sandwiches, sides, and desserts, increasing bowl capacity and merchandising appeal. To keep packaged foods from spilling or leaking, each Dart C24HBD features a leak-resistant seal between the lid and the container. The crystal clarity of the Dart C24HBD provides excellent product visibility to increase impulse sales, while the elegant design creates an upscale presentation for your food. These hinged bowls are perfect for holiday cookies add a seasonal ribbon and it makes for a wonderful gift. Airtight and ready to eat or freeze!